VILLAS AND APARTMENTS TO RENT IN JALON VALLEY, SPAIN. 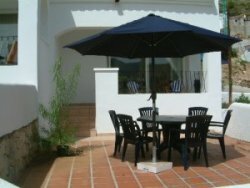 Welcome to our selection of holiday homes to rent in Jalon Valley, Spain. The Jalon Valley or Vall de Pop is located inland from the Costa Blanca and is actually a series of valleys that wind their way down to the seaside resort of Denia, Javea and Moraira. The Valley, with its open spaces, pretty villages and outdoor activities, has long been a popular day trip destination with tourists staying on the coast who are looking for a change of pace or some peace and quiet. If you like walking, you will be spoilt for choice with the number of trails that you can follow in the region, some little more than a stroll while others can take all day. There is even a book that has been written on the subject and maps of the trails can be found in local tourist information offices. The main town in the Jalon Valley is Jalon itself. More of a small village, Jalon is well worth stopping off at on your journey through the valley, if only top pause for refreshments or to pick up something for a picnic further on. If you decide to stay overnight, there are plenty of �bodegas�, bars that offer the chance to sample some of the famous local wines. Jalon is most famous for its blue-domed church which can be seen for miles around. The buildings in the village are a mix of North African and European architecture, like many places on this south coast and wandering the narrow streets admiring the buildings and open squares is a pleasant way to spend an hour or so before you move on, up or down the valley. Walking is the main activity that you can enjoy in the Jalon Valley, though make sure you check out the potential pitfalls of any planned route in advance, as some are quite steep and unsuitable for young children. Some of the most impressive routes line the Barranco del Inferno gorge or can be found in the Marina Alta area where the climbs are rewarded with great views of the surrounding scenery. You could even try tackling the huge Montgo mountain overlooking the town of Javea that dominates the skyline for miles around. More gentle strolls can be taken in the valley bottom, where you can often loop back on yourself to make the walk as long or as short as you like. If you would prefer someone else to do the hard work, there is an equestrian centre at Benissa which organises day-long rides in the Valley. Looking for self catering holiday accommodation in Jalon Valley? Then below is a selection of apartments in Jalon Valley and villas in Jalon Valley that can be rented direct from their owners. You can either click on each listing for further details or you can use our search engine on the left if you are looking for something in particular.